Talking Tiny Toilets… with Total Transparency! Of all the questions I am asked about going tiny, the ones I hear most often center on the topic of toilets. So today, I am going to break it down for you: What people do for a tiny house toilet, the prices, the ease of use, and the pros of each. 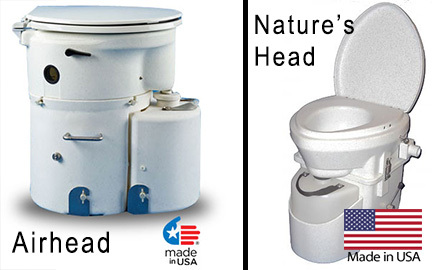 Above are two examples of a composting toilet. 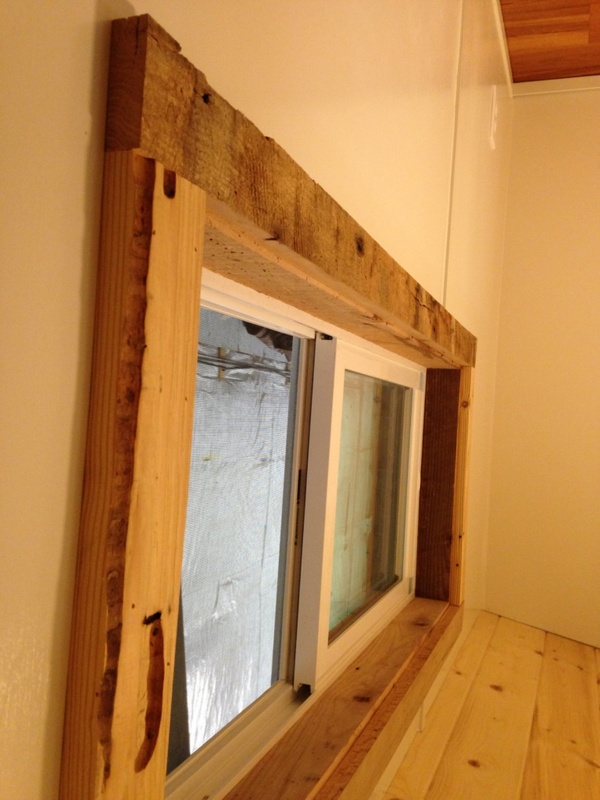 They are the most popular option ( at this time) for tiny house customers. Composting toilets use the natural processes of decomposition and evaporation to recycle human waste, or “Humanure” in the words of those living the tiny life. 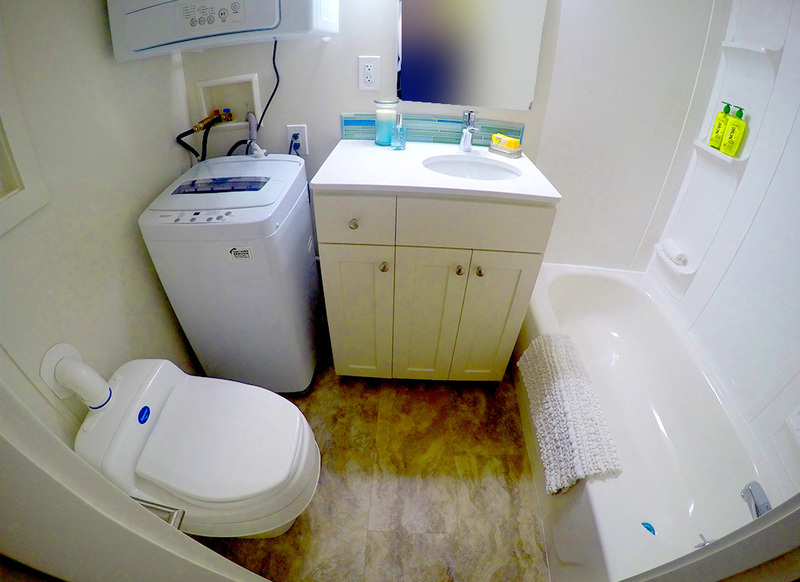 The composting toilets that we install at Seattle Tiny Homes are almost always a multi-chambered, or “dry” composting toilet. The urine is diverted into a separate chamber (for evaporation or removal.) This is a significant improvement over older composting toilet designs as it greatly reduces the amount of solid waste that needs to be broken down. There is a small handle on the side that you turn after each use, that feels familiar, like flushing a standard toilet. A ventilation hose with a small fan speeds the drying of the waste and helps it along in the desiccation process. If you think of a banana skin and what happens to it as it dries out, you’ll have a good idea! In some designs, carbon additives must be placed into the toilet to help with the composting process. These are easy to obtain materials such as peat moss or coconut ﬁber blocks. These modern composting toilets typically hold approximately 60 to 80 uses, although the liquid may need to be emptied more often. Be aware that human urine is sterile and does not pose any health risks, so it is perfectly fine to run a simple line to divert urine into the gray water line (where the water from your bathroom sink / shower goes). Another option is to dig what is called a “French drain” outside or underneath the tiny house. This is a small pit, about 2 feet wide and deep, filled with small rocks. You may cover the rocks with landscape fabric and place soil and/or grass seed on the top. A tube can be run directly from the toilet to the drain. 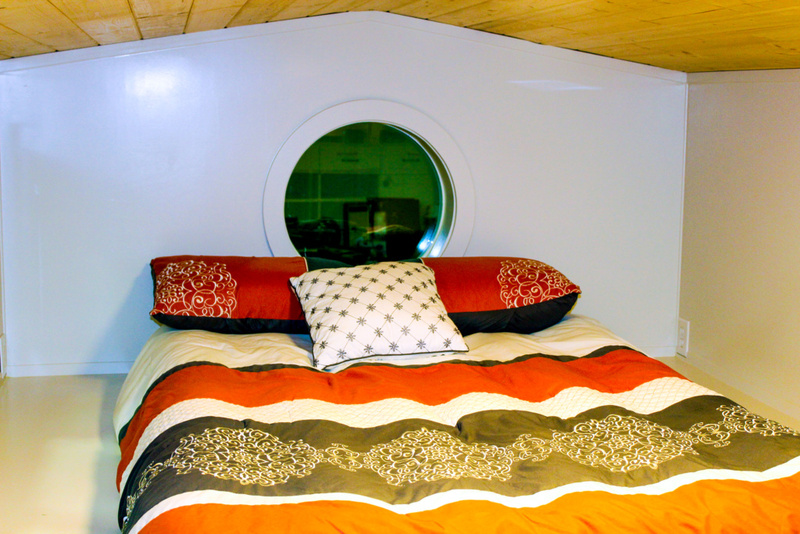 At Seattle Tiny Homes, we think the Incinolet is a great choice for tiny life. Instead of breaking down waste biologically, these toilets literally burn it. They send the waste to an incinerator, where it’s turned into ash that can be disposed of in the garbage. Prior to use, a paper liner is placed inside the bowl of the Incinerating toilet, to catch all waste materials. After use, a foot pedal releases the waste into the incinerating chamber. A button is then pushed to begin the burning process, which takes about 10-15 minutes. The extremely high heat of the incinerating chamber evaporates liquids and burns solids to a sterile ash that can be safely handled and disposed of like any other garbage. When the button is pushed, the exhaust fan also comes on, venting any unpleasant odors outside. As far as cleanliness and convenience go, it is hard to top, but it is by no means the least expensive option and does require electricity. Incinolet with installation is about $2500. Read more about it at Incinolet website. The Dry Flush toilet, by Laveo, has a patented process that doesn’t use chemicals or water, and doesn’t require electricity. 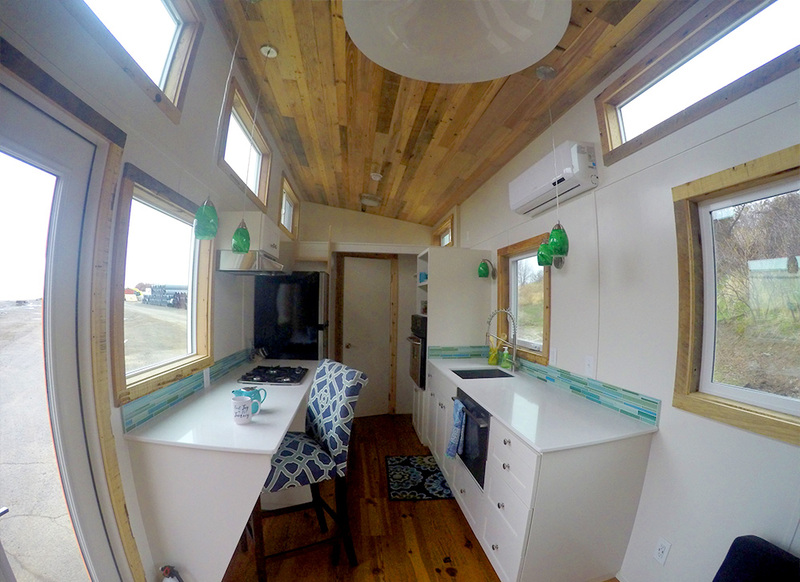 We love to be on the cutting edge of everything new, exciting, and usable in tiny houses. That’s why we are excited about the dry flush toilet. Instead of composting or burning, with this toilet the waste is simply packaged away…parents of young children, think of a diaper genie! A cartridge of shiny, space-age looking liners must be installed prior to use. This provides a smell-proof, leak-proof liner that ” self-seals” human waste away when the toilet is “flushed” at the touch of a button. All waste, solid and liquid, is automatically encapsulated by the battery powered flush into a neat, disposable package that can be dumped with other garbage (yes it is legal to dump humanure in landfills.) It does make some noise when flushing, but results are very clean and sanitary, and can be used literally anywhere. 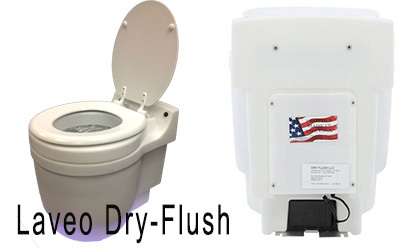 The dry-flush has a full sized standard toilet seat and the advantages of no chemicals, but the cartridges must be purchased regularly. Of course you can have a good old flushing RV style toilet, too! At your request, we will plumb your tiny house just like a traditional RV- to run to tanks (or outside if you will be hooking up to sewer.) 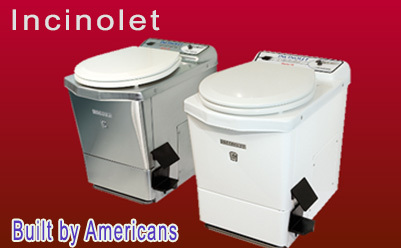 For a RV toilet, there is not that much difference between it, and a traditional “in-house” toilet. There is water and it flushes, although the RV toilet is lighter and some flush from a pedal on the floor. Waste collects in a separate holding tank underneath the tiny house and is emptied from outside the travel trailer. Prices vary! There’s a lot to choose from. What we have discovered in the custom tiny home business…. No matter the reason for purchasing, or who is buying, everyone has a tiny dream. 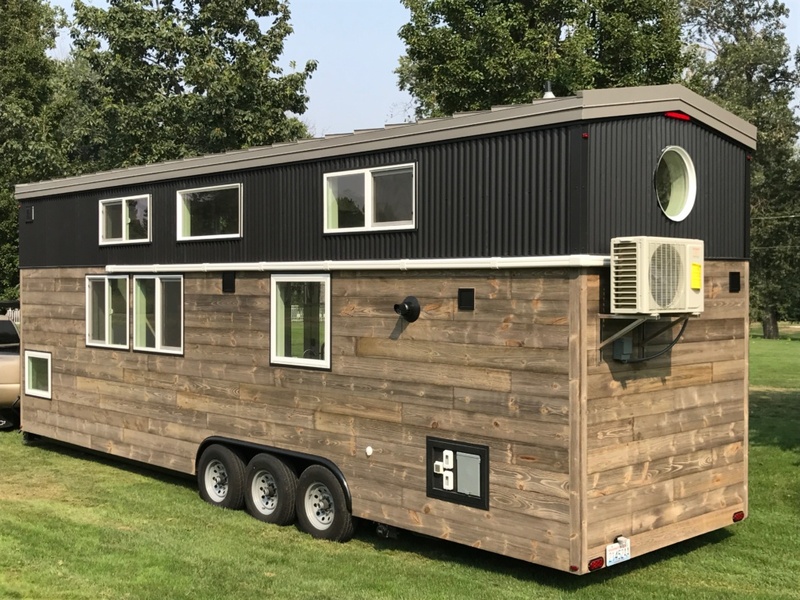 We build tiny offices on wheels that are 12 feet long, to “massive” tiny moving homes that are 40 feet long with a deck. We build every size in between, using every idea imaginable, with every type of materials you can think of, and it is so much fun. We love every one of our customers and we love our business! What is really exciting for us? Challenges! 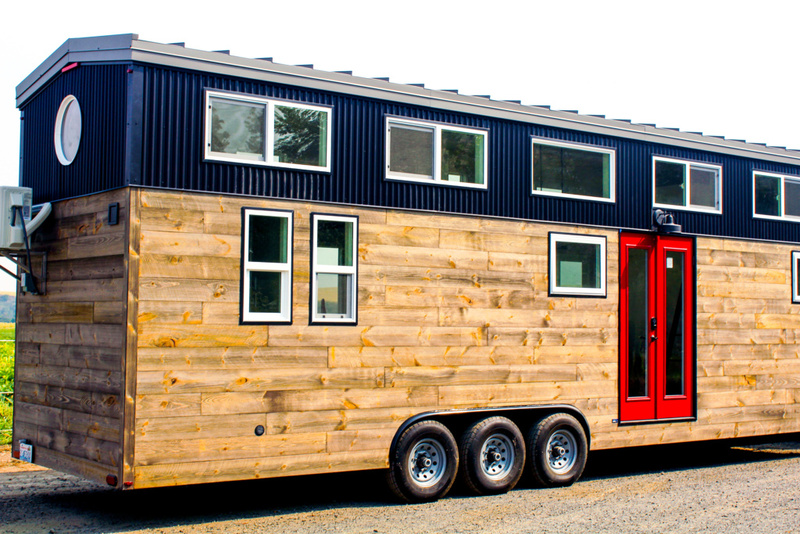 And the idea of fitting an entire family into a tiny house on wheels might be considered a challenge. This is one we are happily rising to. More and more, families are looking at the tiny life. With the cost of a 2 bedroom home skyrocketing in some parts of the country, it just makes sense to get a RV loan instead of a mortgage, and plan a tiny house that will suit you and your family now, but still be small enough to manage after the kids have grown up. A 32 foot RV can fit more people comfortably than you might realize! This one-of a kind featured model was built for just that, a family with 2 young daughters who will share a bedroom on the main floor while parents sleep in the main loft. The Wallingford Luxury …a 32 foot creation of beauty, design and craftsmanship! 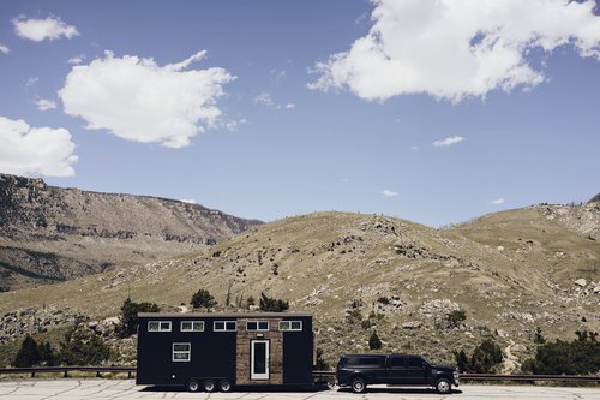 Check out the video to drool over this amazing tiny house. Reclaiming in a BIG way for a tiny house! When we build you a home on wheels at Seattle Tiny Homes, we take our relationship with you as a customer very seriously. While other builders may have forgotten what it means to craft beautiful, fully personalized homes that are meant to last a lifetime, you are who we’re thinking of every morning when we turn on the lights in our shop. It only makes sense that our customers should get a custom product tailored to fulfill their unique goals. 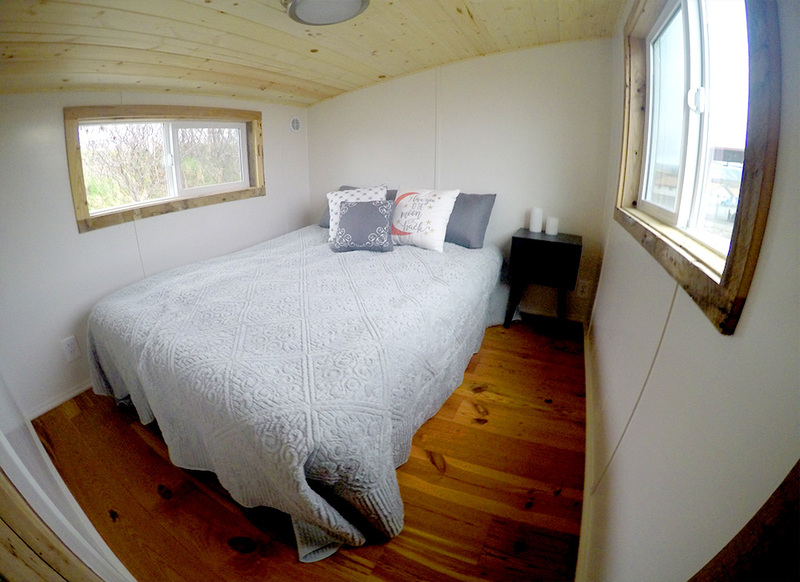 Our commitment to personalizing has made for some interesting stories at Seattle Tiny Homes and our journey. One of these recent customization stories began over a hundred years ago in a hardwood forest in Mississippi. Many years ago, a young family moved to rural Mississippi for a fresh start, raising cattle and tilling the soil. Needing a barn, they sawed out planks from the surrounding hardwood glades and built a cozy home for their livestock and machinery. A couple generations later, the family moved away and the farm, with the barn, was sold. Farming techniques and land use changed with time, and the old barn fell into disuse. The sweet smell of fresh hay, the swish of a contented cow’s tail, and the laughter of playing children only survived in childhood memories… as the lonely barn began to lean with the wind, stalls vacant and its corrugated roofing swinging askew. But a new day, and a new life for those old boards was soon to dawn. Bringing memories into the present…. A relative of a recent client of ours, who cherished those memories of carefree days at play in the hayloft, decided to do something with the barn before it completely collapsed and rotted away. She spent the better part of September 2016 reclaiming the weathered white oak and other mixed hardwoods from it. With permission of the barn’s current owner, she and her family and friends painstakingly dismantled it board by board. 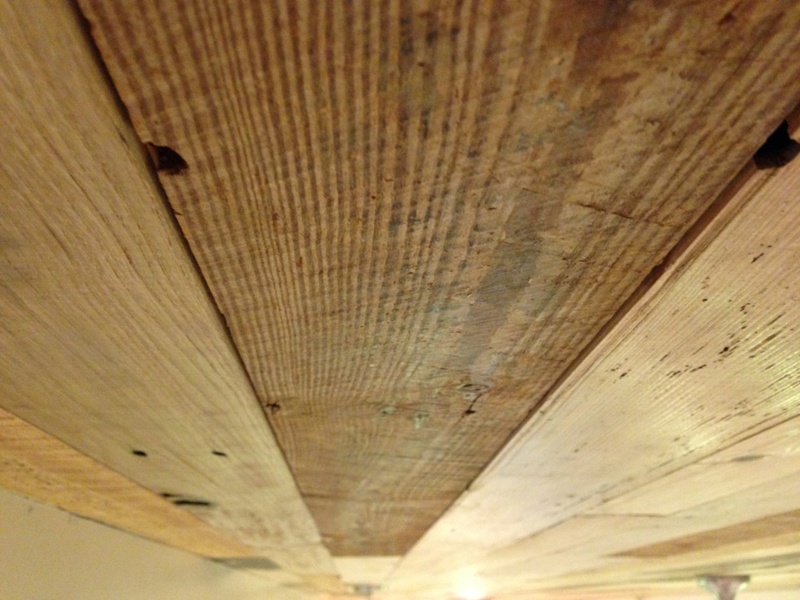 Those planks were then trucked out to the West Coast for use as flooring in a new home. Material left over from that project was kindly gifted to our client, thus keeping it in the extended family. It’s the memories and family connection with those wizened planks that makes them so special, after all. That, and they’re gorgeous—functional art at its finest! Living and working in urban Western Washington, our client needed a place to unwind, to rest and refresh her soul. That’s when she came to us with ideas for a tiny home to park on the shores of Lake Chelan. This would be her retreat. 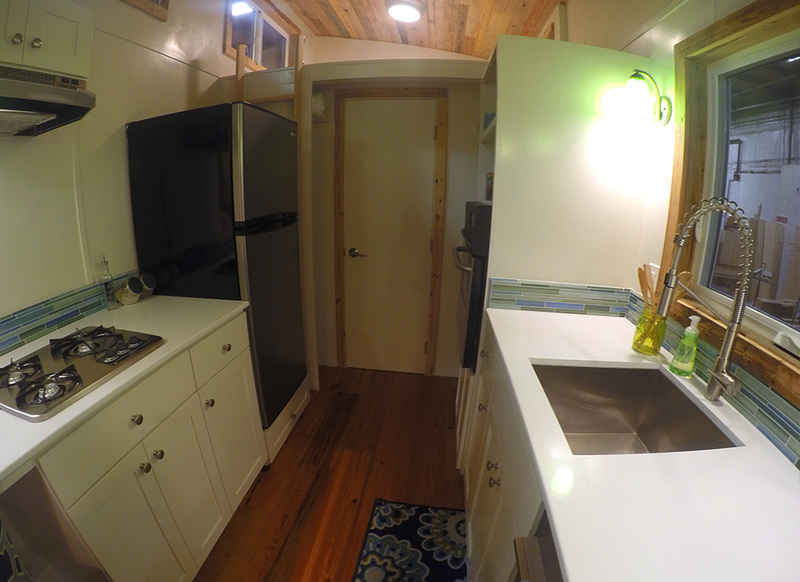 Built on a 34’ fifth-wheel trailer and based on our most popular plan—the Alki—our client’s tiny home is exactly the way she wants it. A kitchen to fit her cooking style, built-in desk space for work and meals, and a layout with room for a full sofa… these were just a few of the personalized details that we made a reality. Lots of windows line the walls, opening the space up to the great outdoors and the stunning views surrounding Lake Chelan. We were even able to fit a bedroom over the trailer hitch, with room for a queen-sized bed and the headspace to stand up and walk around. 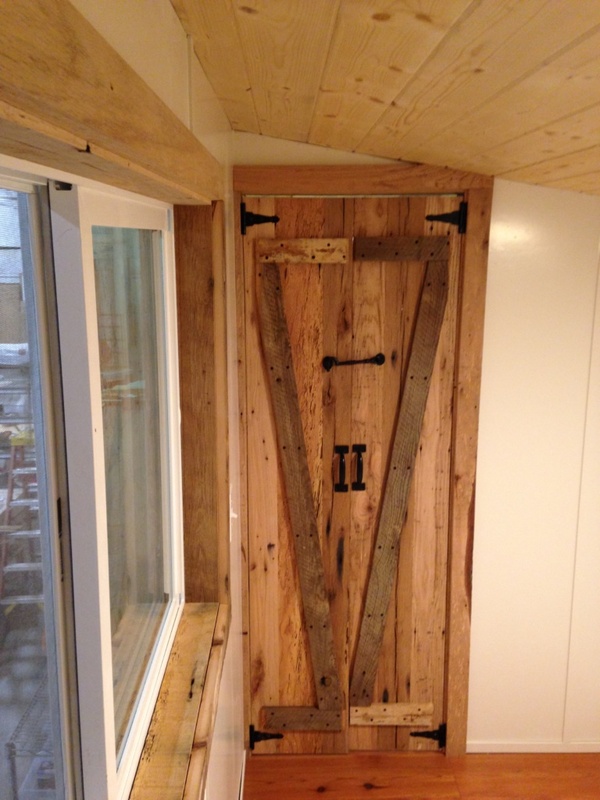 A custom butler door crafted from remnants of the family barn beautifully privatizes this sleeping space at the top of the steps from the rest of the house. Windows and doors are framed with the barnwood throughout, and the paneled ceiling tops it all off. While everything about this house meets our exacting standards of durability, livability, and beauty, this home’s crowning feature is its original, reclaimed barnwood trim. Like the unique lines creasing the palm of your hand, these old boards tell a story, one all the more special because it’s a story of peaceful play, of the fruits of agrarian toil, and the longevity of family ties. Like the knot holes in the door casing, the beetle tunnel running through the sill on the kitchen window, and the nail holes peppered about, none of us is perfect, but we’re all beautiful, and we all have a story to tell. You may not have an old barn in the family, but there are a thousand other ways to write your story with a custom tiny home of your dreams. Get in touch and let’s get started planning today! That is why we call them “Seattle’s Tiny Jewels.” Each one is like a perfect little many-faceted gem, built from scratch for our customers who have a BIG tiny dream! 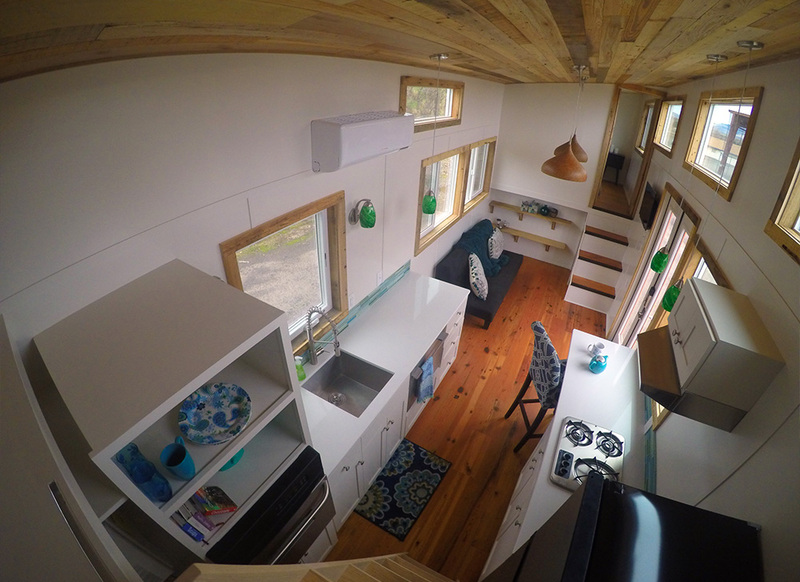 Hand-built by a crew of very talented tiny home experts, you will see every phase of your tiny house’s build, from the plans to the delivery day, all uploaded for your viewing pleasure to the customer folder on the drive. Choose your roof, your siding, your colors, your house’s layout. Why shouldn’t your tiny house express who you are? We think it should. This beautiful Alki has everything you could dream of, including a bedroom over the 5th wheel that you can stand up in! 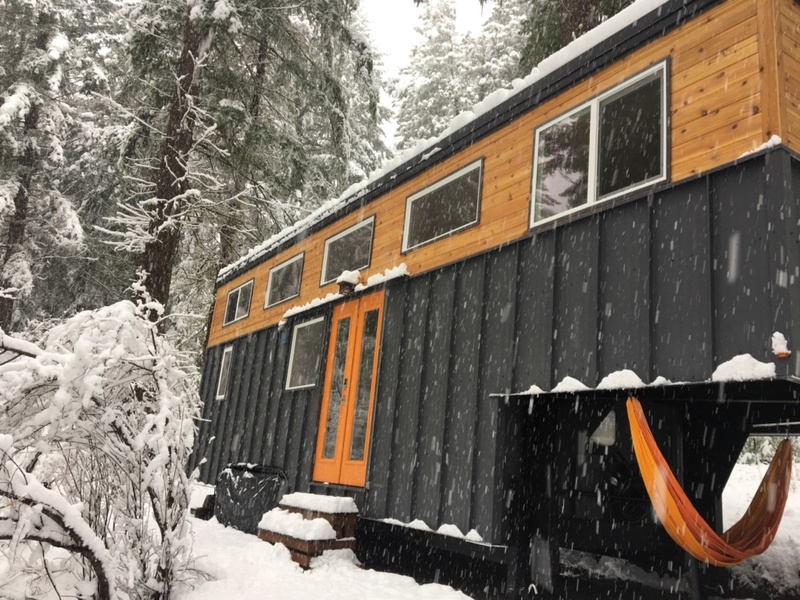 Recently, we had the great fortune to get some of our most frequently asked questions answered… by one of our favorite customers who is living in his hand-built Seattle Tiny Homes tiny house on wheels. Some of you might have seen these folks on the episode of Tiny House Nation, “Big Dog, Tiny House” last season. 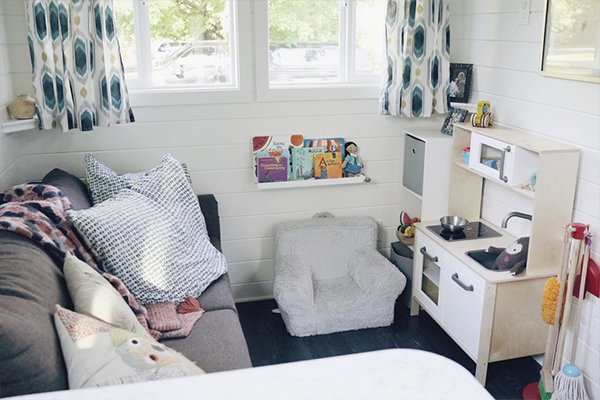 The Porters are a young couple that are using their tiny home to travel, and living in it with not only their (very) big dog, but also their adorable toddler Emery. (We were so grieved to hear of the passing of one of their two big dogs in the summer. We send them our deepest condolences. Losing a pet is so hard!) Below is our interview with Sean…. Q: What made you go tiny? With me working from home, living tiny and mobile was a way for us to be able to travel and see the country and spend larger amounts of time with our families and friends without having to leave our dogs behind. This desire in addition to not being able to afford to live in the area that we wanted to made the time before Emery was in school the perfect time to embark on this adventure. Q: Can you tell us about your tiny home journey? We always loved HGTV, and from there we saw a couple of shows about tiny houses, and then randomly came across other shows as well that continued our interest in the movement. Initially, my interest was more from the aspect of building it myself whereas my wife is the minimalist and loved the idea of getting rid of all our stuff! We started considering doing it ourselves as I’m more than capable of building it and since I had tons of free time at the time. I started looking into designs and options. We found a website tinyhousebuild.com and read up of their story (among many others) They were offering the sale of plans (half off at Christmas) so we bought their plans. Shortly thereafter, we found out Kate was pregnant and therefore any thought of a TH got put on hold until we figured out how to handle life with a little one. Fast forward 4 months, we sold our 2600-sq. ft. house and moved into a 750-sq. ft. house closer to Kate’s work. Fast forward another year, our landlord wanted to sell his house, we wanted to live in that area but couldn’t afford it, so suddenly, we were seriously considering a tiny house. This is when we started looking at options for financing, sourcing, and building. I still really wanted to build it myself, but we ran into a lot of problems finding financing. So we started looking elsewhere, and that was when we came across Seattle Tiny Homes and Sharon. After meeting with Sharon, her enthusiasm and attention to detail earned our trust which helped seal the deal. Q: Can you tell us a little about the Build Process? If anyone has built a home (or tiny home) from scratch, there is a LOT that goes into it; a lot of details and decisions that need to be made. The initial planning discussions went well, Sharon told us some of the general ideas that we needed to follow to stay within RV certification and worked with the designs and needs that Kate and I had put together. After getting a floor plan together came the hard part. 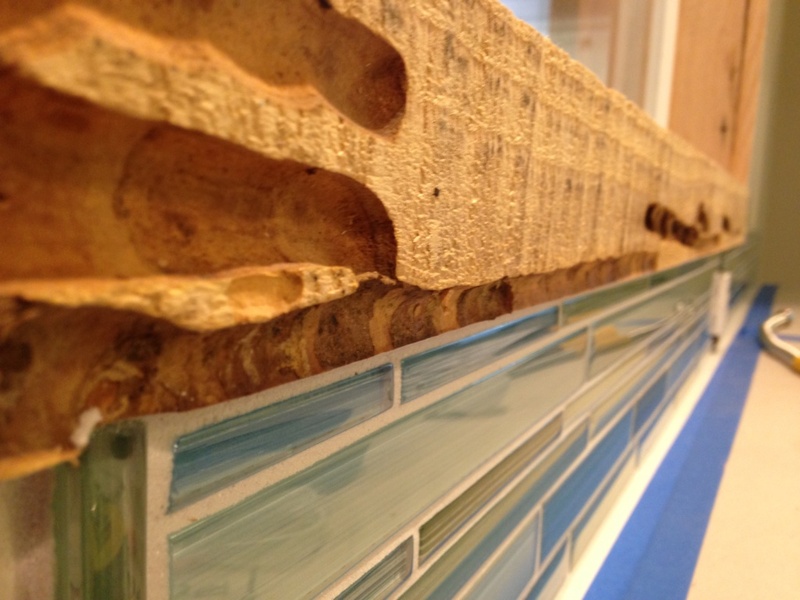 There were decisions based around finishes, lighting, plugs, countertops, floors, cabinets, walls, light switches…. obviously, the list goes on. If I had one complaint about the process, it was regarding some of the decisions that needed to be made. For the most part, Sharon would generally tell us we could do anything we wanted to…. Unfortunately, this can get extremely tiring to do all the research on all the options for things! Q: What is life like now in your tiny house? Life is an adventure. There are difficulties and compromises, but we’re making it work and are loving the time we’ve spent visiting with family and friends. We love almost everything, the joys of fully custom building, you get exactly what you want. The light and bright feel we were going for is present in the entire house. Q: Are there aspects of your tiny house not often seen in others? We were planning our tiny house for 2 adults that work from home, 2 large dogs, and a toddler. So a number of those things had to be taken into account. I think generally speaking, you don’t often see a full size standard crib in a tiny house, or a dishwasher / peninsula. The kitchen was a huge part of our design, and we had to love it, so the 3cm silestone counters, and the marble tile backsplash had to happen. (Despite their weight addition.) I also don’t often see people in the TH community with our design style. Most seem to go with warm and rustic, and we went with light, bright and modern. Q: Have you made adaptations and changes since you moved in? Closets / Clothes storage / Storage in general. We added closets up in the main loft as well as a dresser, we added a bunch of high storage in the nursery and a whole storage unit the secondary loft as well. Beyond that, it’s been mostly organizational things. Q: What do you do when we need time or space? Q: Do you see generational differences with regards to going minimal? The baby boomer generation coined the concept of “Keeping up with the Joneses”; I think that our generation doesn’t suffer from that same sort of stigma, at least not to the same extent. There is also a surge in the love of the outdoors and the desire to see a lot of it and going minimal and tiny makes that easier. To read Kate’s blog post about Living Tiny, go HERE. To see what the Porters are up to now, you can visit them on Instagram! We deliver to all 50 states. Contact us for details. Copyright © 2019 Seattle Tiny Homes. All rights reserved.